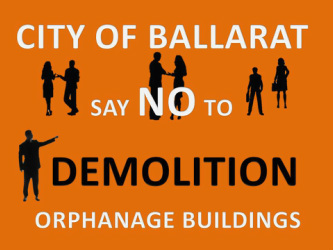 Ballarat Orphanage Demolition & Rezoning Amendment - Ballarat District Orphan Asylum, Orphanage, Children's Home 1865-1980's Never Hidden Or Forgotten! Ballarat District Orphan Asylum, Orphanage, Children's Home 1865-1980's Never Hidden Or Forgotten! Very long, bitter battle but common sense has won. Brick Wall on Stawell Street. "The former Ballarat orphanage and school will receive heritage protection, making way for new development while conserving a historic site near the Ballarat CBD. Minister for Planning, Richard Wynne, has approved a planning amendment that specifies what can be built on the site, along with heritage conditions. The planning amendment will allow for residential development, a medical centre, supermarket and shops. Community consultation identified broad support for building on the site so long as its heritage was protected". Media Release 20th of May 2015, to read more Click Here. Orphanage School & Crying Wall SAVED! Few former residents attend what they hope would be the last hearing meeting into the Orphanage / Children's Home School and the Crying Wall. 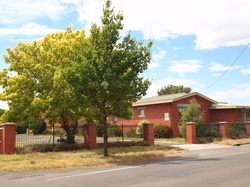 The Victorian Civil & Administrative Tribunal (VCAT) on the 17th of October 2014, Residents who attended the hearing along with City of Ballarat Council representative heard the words from Developers Legal Representative telling the Commissioner they have withdrew their appeal to Demolish the School House and the Wall. They must remain intact on the site. All other buildings on the former Orphanage site will be demolished after the Minister of Planning has made his final decision on the Re-Zoning and Heritage Overlay of the site there has been no decision to date. Former Residents have battled for over four long years and are very delighted with the hearing outcome . This tremendous outcome was achieved because of the dedication and teamwork by all involved. Many Thanks to Ballarat Council , Ballarat Trades Hall, Ballarat East Network and the community. Finally the Courageous Former residents who battled it out right to the end . Big question now is what are the developers plan to do with the school house building? Former residents are still holding the idea of it becoming a Museum . The Responsible Authority is directed to advise the Tribunal if and when the Minister for Planning approves Amendment C164 to the Ballarat Planning Scheme. The matters are adjourned for administrative mention on a date to be fixed as soon as practicable after the Minister for Planning has approved Amendment C164. The Tribunal was informed by solicitor for the Responsible Authority, that Amendment C164 to the Ballarat Planning Scheme was adopted by the council on 23 July 2014 and forwarded to the Minister for Planning for approval on 15 August 2014. The amendment was adopted incorporating the recommendations of the Ministerial Panel save for two modifications relating to the School House building and the Stawell Street wall. 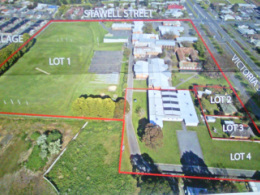 The Tribunal was informed that the effect of Amendment C164 as adopted by the council was to remove the requirement for a planning permit to demolish any buildings or structures on site other than the School House and the Stawell Street wall. Demolition of all or any part of these structures required a planning permit. Solicitor for the developers The permit applicant, Victoria Street Developments Pty Ltd advised that his clients had not sought a permit to demolish the Toddlers’ Block. Further, he was now in receipt of instructions that his client did not wish to demolish the School House or any part of it or the Stawell Street wall, including any breach of the wall. The objectors applauded the permit applicant on this decision. In these circumstances, assuming the Minister approves the amendment in the adopted form, there is no longer any need for the permit. However, a final decision cannot be made until the Minister makes his decision. If the decision is to approve the amendment in the adopted form leave would be granted to both the permit applicant . Former Residents are one step closer in saving the Orphanage School and the Wall. Ballarat Orphanage/ Children's Home School has been saved. Ballarat City Council voted seven to one at its Wednesday night meeting to retain both the school building and the entire Stawell Street wall. The Councils decision was a correct one now their recommendations will now go to the Minister along with the planning panel report and the Minister for Planning will make the final determination. Ballarat Trades Hall have been very supportive towards former residents cause an repetitive attended the council meeting a little write up of thoughts about the meeting outcome . " Thank you to the City of Ballarat Councillors at tonight's meeting for once again affirming their desire to see the entire school building at the Ballarat Orphanage site protected and incorporated tastefully and sympathetically into a new development. The developers threatened that 70 jobs and the entire development would not be realised if they did not get their way. Holding this threat up to the former Residents and Staff, Councillors and Trades Hall was disgusting - jobs and people are important - the jobs are still there, heritage and history has been protected, the story of the Orphanage and its role in Ballarat is retained and if the developers are clever the new development incorporating old and new could be amazing". DISTRESSED former residents of the old Ballarat Orphanage have penned a letter to the City of Ballarat urging councillors to reject an application to demolish part of the site’s school house building. The campaign is being spearheaded by former orphanage resident Deborah Findlay, who submitted a letter to council this week signed by six past residents. The submission calls on councillors to reject rezoning the section of land where the former school house building sits and retain the facility in its entirety. A report is being tabled at Wednesday night’s council meeting recommending the city adopt the planning scheme amendment to rezone the former orphanage site into a combination of residential, mixed-use and commercial zones. It also recommends council demolish a large section of the former school building under the provision that at least the two front rooms of the building are kept. Debate has surfaced in the community since a developer purchased the site in 2011 for a residential subdivision with a medical centre and shopping complex. Last year, a former resident who was abused in the orphanage made a blood claim to the land and highlighted the possibility of human remains on the site. Adjoining residents have also expressed concerns about the risk of flooding and building heights overshadowing residential properties, while VicRoads suggested there would be implications for traffic.“ It will be a very sad day when that building is demolished because a part of us will be irreparably lost.” - Deborah Findlay The application has been subject to a Victorian Civil Action Tribunal appeal and considered by an independent panel. Ms Findlay said of the 13 buildings on the site, the majority of the former orphans only wanted to obtain the school house building. Ms Findlay was an orphan at the children’s home from 1969 to 1981 and said the building was of historical, cultural and social significance. “I don’t think the residents have asked for much,” she said.“ It will be a very sad day when that building is demolished because a part of us will be irreparably lost.” She said former residents had battled for years to have their voices heard.“ We have made submissions and went to hearings in support of retaining the whole school,” she said.“ We are disappointed and shocked that after all this, the developers have done what they always wanted to do and only agreed to keep a minimum of two rooms.” The former orphanage, which was later used by Damascus College as its junior school site, was built in Victoria Street in the mid-1860s and was home to more than 4000 children. Under the application, the former toddlers’ block would be retained and converted into a medical centre. The site’s mature elm trees, the Stawell Street wall, the front memorial garden, a shade structure, several magnolia trees and the memorial Ludbrook seat will also be preserved. In in its report, the panel did not support an individual heritage overlay being placed on the school house building, but it did support including a citation which clearly outlined that the building had social significance. Victoria Civil and Administrative Tribunal HAS ADJOURNED THE HEARING TO A LATER DATE! The Council and Former residents went to VCAT today 22nd /4/2014 it was scheduled for three days however the panel heard some submissions today they decided to adjourn the hearing till at later date , because last week Former Residents and Council on the 19th of April attended the Ballarat Planning Scheme Amendment C164 Proposed Rezoning Former Ballarat Asylum, Orphanage Children’s Home 200,200A & B Victoria Street Ballarat East. PLP/2013/119. and there want be outcome for six weeks. VCAT felt it was better to wait till the outcome of the Ballarat Planning Scheme Amendment C164 hearing outcome before they could make their final decision for demolition of the site of the buildings . Every submission from former residents and wider community did a totally tremendous job this outcome is the right one at this stage. Where do we go from here former residents feel they need to write a letter to Council Planning Scheme and organise a meeting to discuss what they feel and to what buildings are significant and must remain and be reused . At this Stage former residents and supporters who have been through this journey from the very beginning they have been able to save the Toddlers Block, Stawell Street Wall now to remain intact , some trees , the journey has been long and very rewarding. Planning panel to announce decision on former Ballarat Children's Home next month By RACHEL AFFLICK April 24, 2014,An independent planning panel is expected to make a recommendation next month on the future of the former Ballarat Children’s Home. The former orphanage, which was sold to a developer in 2011, is earmarked for a residential subdivision with a medical centre and shopping complex. The panel heard evidence last week from developers, town planners and objectors in a series of hearings at the Ballarat Town Hall. A legal appeal has also been adjourned by the Victorian Civil and Administrative Tribunal. The City of Ballarat recently approved several buildings on the site for demolition but rejected the developer’s bid to knock down the majority of structures. The developer is appealing for VCAT to overturn the decision. Ms Findlay said a three-day hearing was adjourned this week as VCAT wanted to wait to see the outcome of the independent planning panel’s advice. The demolition application for the Victoria Street site received more than 30 objections from the public earlier this year. A former resident has also made a ‘blood claim’ to the land and highlighted the possibility of human remains on the site. Meanwhile, adjoining residents have expressed concerns about building heights overshadowing residential properties, while VicRoads suggested there would be traffic implications. At a council meeting last year, a spokesperson for the developer said his client acknowledged the site evoked strong feelings, but only some elements warranted retaining. FORMER Ballarat Children’s Home resident Deborah Findlay will be calling for the preservation of her childhood memories when she speaks at an independent planning panel hearing on the site’s development today. The independent panel is considering submissions from developers, City of Ballarat planning staff and objectors before it will make a recommendation to the council on the future the Victoria Street buildings. The former orphanage, which was sold to a developer in 2011, is earmarked for a residential subdivision with a medical centre and shopping complex. However, the council is seeking independent advice on the proposal due to the high number public submissions. Ms Findlay said former residents would attend hearings at Ballarat Town Hall today and tomorrow. “It is of historical, cultural and social significance to a lot of people,” she said. The council recently approved several buildings for demolition but rejected the developer’s bid to knock down the majority of structures. The developer is appealing the decision in the Victorian Civil and Administrative Tribunal (VCAT), with a three-day hearing to be staged in Ballarat from Tuesday. Ms Findlay said many former residents would be attending the appeal in support of the council’s ruling. “That there are 13 buildings on that site and (the developer) is only looking to retain one, I think is pretty unreasonable,” she said. Meanwhile, the land stills need to be rezoned for commercial, mixed and residential use for the subdivision to proceed. Ms Findlay said she objected to the rezoning because she believed significant buildings, such as the former school house, should be protected. Under the developers’ plan, only the former toddlers’ block would be retained, along with mature elm trees, the Stawell Street wall, the front memorial garden, a shade structure, several magnolia trees and the memorial Ludbrook seat. The City of Ballarat has received an application to amend the Ballarat Planning Scheme for the property known as the former Ballarat Orphanage, 200, 200A & 200B Victoria Street, Ballarat East. The applicant is St Quentin Consulting on behalf of Victoria Street Development Pty Ltd. The formal public exhibition period for Amendment C164 to the Ballarat Planning Scheme commenced on Thursday 31 October 2013 and will close at 5pm on Monday 16 December 2013. BALLARAT City Council is calling on public submissions into the fate of the former Ballarat orphanage site. The council yesterday released information on a planning scheme amendment request for the Victoria Street site, including a proposal to develop the site with a supermarket, shops and medical centre. The amendment proposes the site, at 200, 200a and 200b Victoria Street, be rezoned into a combination of residential, mixed use and commercial zones. Debate has surfaced in the community since a developer bought the site in 2011. The former orphanage, which was later used by Damascus College as its junior school site, was built in Victoria Street in the mid-1860s and was a home for more than 4000 children during its tenure. A number of former orphanage residents have voiced their concern at the site being redeveloped. Phylis Read, who was abused while at the orphanage, and was one of the last three children on the site along with her twin sister Edith and younger sister Rosemary, made a “blood claim” on the site at the September 14 Ballarat CIty Council meeting. “I say it’s our blood, so it’s our land,” Mr Read said at the time. Council has urged anyone who may be affected by the new amendment to make a submission to council by 5pm on December 16. Submissions can be in any form including email, writing, photographs, drawings, paintings and recordings. Once the public exhibition period finishes, a report will be prepared summarising the submissions received, before council considers the report and makes a decision. Anyone wishing to discuss the proposal can contact the city’s strategy unit on 5320 5103. THE City of Ballarat has been urged to do everything in its power to protect the heritage of the former Ballarat orphanage site. Confused and distressed former Ballarat Children's Home residents called on councillors at last night’s ordinary meeting to provide answers on the site’s proposed demolition. A petition with 498 signatures was also presented to the council, calling on it to protect and commemorate the historic site at the former Ballarat orphanage, which since 1865 had been part of the City of Ballarat’s heritage. The petition noted that the orphanage looked after more than 4000 children, many who were now proud residents of Ballarat. Deborah Findlay, who was placed in the orphanage as a young girl, asked the council why former residents weren’t informed of the demolition application before signs went up at the site last week. Ballarat Mayor John Burt told the gallery no decisions had been made and the City of Ballarat had met with Child and Family Services with a view to connecting with as many former residents of the orphanage as possible. He said the council would not allow the demolition application to compromise the protection of heritage aspects of the site. Council CEO Anthony Schinck confirmed the council had received an application from a developer to demolish all but a few of the buildings on the site. He said another application by the developer to rezone the site was yet to be determined. “There are lots of opportunities for the community who have strong feelings on what should or shouldn’t happen at that site to provide that feedback to the council,” he said. Residents were concerned they had only less than two weeks to make a submission on the demolition permit to the council and asked for an extension to the process. But Mr Schinck said a two-week extension could be granted.